Summary: This presentation will help consultants, growers, and other practitioners in the soybean growing regions of the U.S. and Canada understand maturity group designations of soybean varieties developed by public and private institutions or companies. Flowering and maturity of soybeans are determined by the day length of the location where they are grown. Soybean breeders have developed thirteen maturity group designations (using roman numerals) ranging from 000 to X. 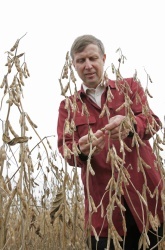 Maturity group 000 (triple zero) would designate soybean varieties adapted to tropical regions. In the U.S. producers grow maturity groups 00 to VIII. Many companies or institutions now use Arabic numbers for maturity groups and divide each maturity group into tenths (for example 2.9 or 5.8). If planted in mid-May, a full season variety (for a given location) will mature before the first frost (late September to early November). Maximum yield is usually obtained by using a full season variety.